This non-profit group’s mission is to protect and improve the health of animals throughout the country while providing regulations for animal supplement manufacturers to follow nationwide. The NASC’s efforts have helped to standardize the industry and provided a way for consumers to know they’re buying a quality product. To become a member of the NASC, the business must meet the strict quality standards and complete a comprehensive audit to ensure manufacturing requirements are met. Additionally, there are stringent quality control, adverse event reporting, label, warning and caution statement guidelines that must be met for each product produced. 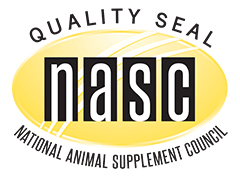 As a consumer, the NASC seal on a product ensures you’re receiving a quality, regulated item from a reputable company. You can visit www.nasc.cc to learn more and view the member directory for a complete listing of NASC approved companies. Obtaining a United States Patent is a lengthy process and one that most animal supplement companies don’t go the extra mile to obtain. This can either be because of the time and costs involved or because their formulas are not unique and proven. Arenus’ products are each uniquely formulated and, for many, we have published research from respected sources proving their efficacy. This has positioned us for patent eligibility on many of our products. There there are very few animal supplements or products available that are patented. Arenus is proud to offer eight supplements that have received their US Patent and many more that are patent-pending. As a consumer, this should weigh heavily on your purchasing decisions since, to receive these patents, our formulations had to be proven unique and that they work as stated. At Arenus we are dedicated to research. While many companies cite research on the individual ingredients included in their formulations, we take the time to research our final product. While there is plenty of information available on individual ingredients, there are many variables that can affect their efficacy. The source, manufacturing processes, form, quality and amount are just a few that can make a huge difference on how ingredients will act within the final formulation. When you purchase a product from us, take comfort in knowing that we've already done the legwork and make no empty claims. Each of our products has been thoroughly researched in their final formulations to ensure complete efficacy. In fact, many companies even cite our research to support their own products. To put it simply, our products solve and prevent problems. Guaranteed.